JUSTICE, TEMPERANCE, HOPE, CHARITY, FAITH, PRUDENCE, HUMILITY. 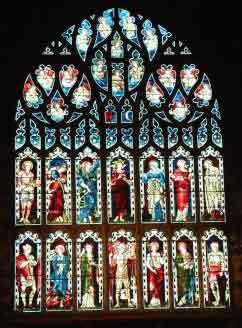 Above the two tiers of figures there is a complex tracery of sky, moon, sun and angels playing musical instruments. With Prudence, Fortitude and Temperance, one of the four ‘cardinal virtues’. In Plato’s ideal city it is justice that regulates the actions of the citizens, both socially and individually, and which underlies the harmonious working of the other three virtues. Renaissance humanists therefore made Justice the leader of the four, and she is thus often represented. The SWORD is the emblem of her power. Represented in the left hand by a head and a skull is the Last Judgement where Justice crowns a righteous person but beheads a sinner. To the Middle Ages temperance often signified, as it may today, abstinence from liquor, and hence was represented by a woman pouring liquid from one vessel to another – diluting wine with water, or, water to put out the fires of lust. This latter would appear to have been depicted in the East Window. With Faith and Charity, one of the three ‘theological virtues’. In Gothic church sculpture she gazes up to heaven and reaches out for a crown in the hope of future glory. An anchor partly hidden in her robes derives from St. Paul who said of hope “It is like an anchor for our lives…it enters in through the veil”. The foremost of the three ‘theological virtues’ (which is why it is probably given central position). “And now abideth faith, hope, charity, these three; but the greatest of these is Charity (1 Cor. 13:13). The N.E.B. uses the word ‘love’ a closer definition. The Church teaches that charity is both love of God and at the same time love of one’s neighbour and that the second was of no real worth without the first. Bonaventura developed the concept of love of God into that of light, or burning fire and in Italian art the figure of Charity came to be represented with a FLAME . In the East Window Charity is shown with flames around her head and she holds a flaming candle in the left hand. Faith , with Hope and Charity – one of the three ‘theological virtues’. Faith is usually shown holding a CROSS which she may have in her right hand in the East window, but she is sometimes shown with a lighted candle and in the East Window Faith is looking towards Charity and their two hands reach out towards each other. Faith is also shown with her foot resting on a stone block representing an unshakeable foundation. The lower part of the representation of Faith shows a small white area which may be a stone rather than the end of a foot. Prudence signifies not caution but simply wise conduct. She is personified as a woman with a SNAKE and a MIRROR. In the East Window the snake is shown between her feet. The snake is derived from Matthew (10:16) “Be ye wise (prudentes) as serpents”. She acquired the mirror in the late Middle Ages; it signifies that the wise man has the ability to see himself as he really is. Prudence is also shown with a BOOK – the scriptures. One of the rarer virtues in religious and secular allegory, represented as a woman with a LAMB. Her downcast look expresses her modesty. Her bent head also suggests the idea that the humbler one is, the higher the spirit rises. Martin of Tours (c.315-397). Christian saint, born in Pannonia (now Hungary); he became bishop of Tours about 370. He was a preacher, the founder of the first monasteries in France, and a destroyer of pagan shrines. He is shown dressed as a Roman soldier wearing a cloak which he has cut with his sword – he is shown holding the shredded part in his left hand; this alludes to Martin, after having enrolled in the Roman army and serving in Gaul, he found a beggar shivering in the winter cold and cut in half his military cloak and shared it with the poor man. That night he dreamed that Christ came to him wearing the piece he had given away. Legendary virgin martyr, formerly one of the most popular Christian saints. But there is no evidence that her story is anything but a romance , and she was removed from the Church Calendar in 1969. Her legend tells how the prefect of Antioch wished to marry her but she refused him, declaring that she was a Christian virgin. She was cruelly tortured and thrown into a dungeon. Here Satan appeared to her in the form of a dragon and devoured her. But the cross in her hand caused the monster to burst open and Margaret emerged unharmed. Her attribute is a DRAGON which she tramples under her feet. (1515-82) Spanish Carmelite nun, born at Avila. She was active in the reform of the Order and established numerous convents in Spain which restored the stricter discipline of the original Rule. Teresa’s personality was remarkable for combining a wealth of practical common sense with a strong mystical element. Like other saints who left important written works, she is seen writing while the DOVE of the Holy Spirit hovers at her ear, inspiring her words. The guardian angel of the Hebrew nation (Dan 10:13,21) whom Christianity adopted as a saint – of the Church militant. His origins probably lie in the religion of ancient Persia whose pantheon was divided into two, light and dark, or good and evil. The gods of light, with whom Michael was associated, were in perpetual conflict with the gods of darkness. Like nearly all angels he has wings and is armed with a spear. He is also represented weighing the souls of the dead to measure their just deserts. Christian saint and virgin martyr of Caesarea. She was condemned to death by the Roman governor, Fabricius about the year 303 for refusing to recant her belief. According to the ‘Golden Legend’ she was accosted on the way to her execution by a scribe named Theophilus who mockingly asked her to send him roses and apples from the garden of her heavenly bridegroom. After her death a child appeared to Theophilus and presented him with a basket of roses and apples. Because of this he was converted to Christianity. Dorothea’s attribute is a basket of ROSES or ROSES AND APPLES. Legendary warrior, saint and martyr, said to have been born in Capadocia in Asia Minor and to have died at Lydda in Palestine about the end of the 3rd century. from early times he was especially venerated in the Greek church; his popularity in the West dates only from the 13th Century. He was made patron of England in 1222 and the Order of the Garter about a century later. The saint is shown in the armour of a medieval knight carrying a broken lance (which helps to distinguish him from other saints in armour), and a shield bearing a cross. After surviving various trials - drinking a poisoned cup, being stretched on a wheel, put in a boiling cauldron - the saint was beheaded.